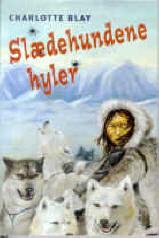 2001 Charlotte Blay's new book Slædehundene hyler (The Huskies are Howling) is a thriller, and also a love story and a coming-of-age story played out against a finely detailed backdrop of Greenland landscape and culture. While staying with her father in Copenhagen, Nannavina is called home to Greenland - her alder brother, folIowing a row with his friend Norsaq, has gone missing in the snowy mountains. Is Nannavina's brother dead? 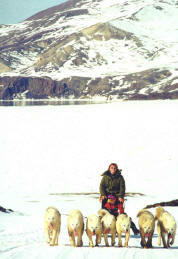 And what is Norsaq really up to? Despite having doubts about Norsaq, Nannavina agrees to accompany him into the wilds of Greenland in an attempt to find her brother. They travel by sledge, pulled by huskies, and the journey turns out to be both dangerous and challenging; but the harsh natural environment helps Nannavina find her true self. The Huskies are Howling is not only a thriller, it is also a love story and a coming-of-age story, during the course of which Nannavina matures from edgy youth to develop into a young woman at ease with her family and cultural background. Now she could see the hazily outlined ruins of the deserted houses. Seen from this side they were faint silhouettes in the snow at the foot of Thumb Mountain. Grandfather's house built of wood and peat was just across on the other side. It would be like coming home, even though grandfather wasn't there. She looked around for bear tracks, but there weren't any. She breathed a sigh of relief. At that moment the huskies began to growl and howl in a frenzy. A large yellowish shape reared up to their right. 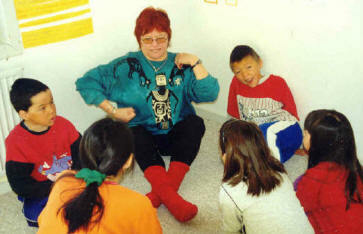 Nannavina saw the polar bear snarling and baring Ion g yellow teeth as it roared. For a couple of seconds Nannavina was rooted to the spot. Then she started cracking the whip, her yells ringing in the frozen landscape. The bear let out another angry roar and trotted atter them in the tracks lett by the sledge. Panic gripped Nannavina when she saw that the bear was gaining on them, even though they were hurtling along at a furious speed.